I was slated to review this album last year but was delayed for various reasons. Which is a real shame, since this unexpected duo really deserves to be more broadly heard and written about. Sarah Bernstein is one of the most consistently engaging violinists, here on voice and electronics. And Kid Millions (John Colpitts) has become one of the foremost improvising drummers, having released several fantastic albums, including one now out-of-print 2015 cassette with Bernstein. Sadly, Kid Millions was recently in a serious car crash, from which he is still recovering. In the spirit of wanting to support his recovery, and the duo’s continued playing, as best as possible, I’m here to recommend everyone reading this purchase the album. 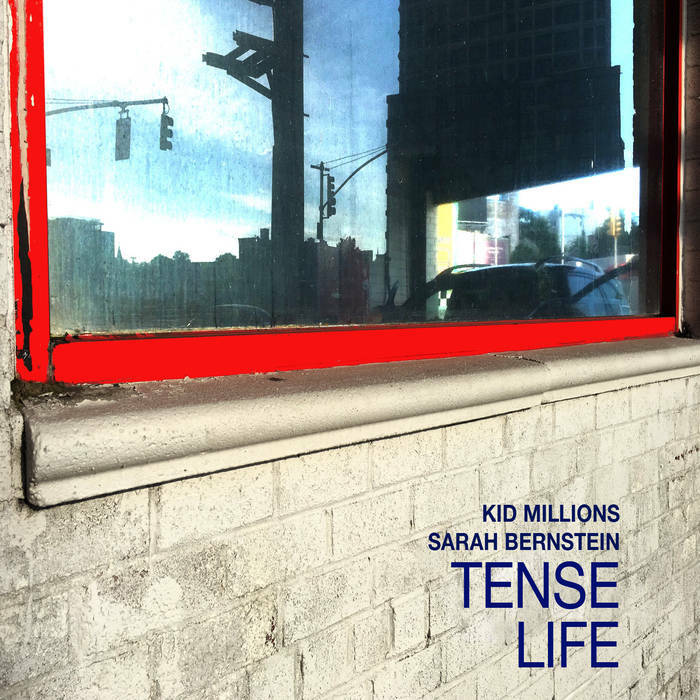 Kid Millions and Bernstein have been performing together since around 2014, but this is their first proper studio album. From the outset, Bernstein in particular is in fine form. 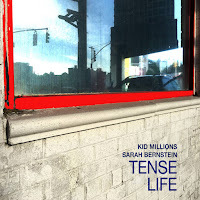 The album features an excellent mix that balances her nicely with Kid Millions’s crisp drumming. Bernstein’s coming into this set from a much different place than her 2016 quartet album, Still/Free. Where that album had a spaciousness to it, Tense Life is packed tightly. Her violin is sometimes heavily processed, amplifying her range and intensity. Take “Novo,” for example, which rests largely on her extended improvisation. Towards the end, as she bows swiftly in the highest register, it feels like watching someone perform a daring stunt. She’s in complete control, but there’s an inherent drama that makes it feel like something, perhaps even the violin itself, could come apart at any moment. The album consists of two lengthy pieces, “Ill of the Dead” and “Comfort Zone,” each around 15 minutes, and two brief interludes, “Slice” and “Partial Guide,” around 2 minutes, with “Novo” slotted in like a bonus. Bernstein’s wordless vocals get highlighted throughout, but she’s particularly good on “Comfort Zone,” where her tones play nicely off Kid Millions’s snare cracks. Kid Millions, whom I first discovered listening to the band Oneida, is an unyielding force, constantly propelling the duo forward. Partway through “Comfort Zone,” Kid Millions jumps from tom to high-hat to snare rapidly, periodically slowing down, like a head fake, before leaping forward again. Something I’ve always appreciated about Kid Millions is the richness of his style, which is like a combination of Weasel Walter and Jim Black. According to news reports, Kid Millions is expected to make a full recovery. I wish him well and hope his recovery is smooth and swift, and, for our sake, I hope he and Bernstein are back to performing and recording soon.